This is the remains of a fish tank that caught fire after the pump became faulty. It is unfortunate that this happened, but luckily SERVPRO of Eatontown/Long Branch was able to help the homeowner with the cleanup. While it is never easy to see the devastation that fire can create, the aftermath can be just as hard to deal with. 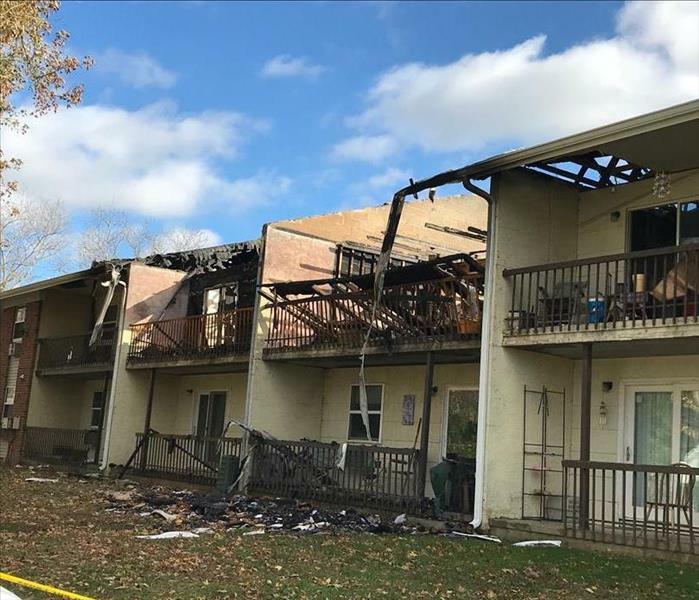 In cases like this, SERVPRO can help the remediate the units in close in proximity with smoke and water damage resulting from extinguishing the blaze. Winter can be devastating to homeowners who don't prepare their homes for the cold. 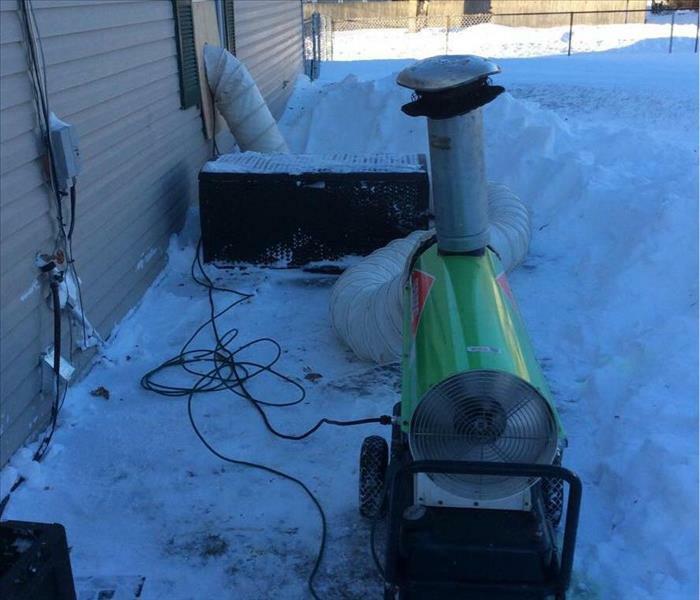 This owner had a pipe that froze then burst in the frigid cold that blanketed the Northeast. By calling SERVPRO of Eatontown/Long Branch, the homeowners avoided further damage to their home. Water damage restoration doesn't always stop at drying what you can see. You need professionals to find moisture in places you CAN'T see. We have the right tools to discover where there may be residual issues once the "obvious" issues have been taken care of. All mold needs is a little moisture to thrive, and it doesn't matter where that is. 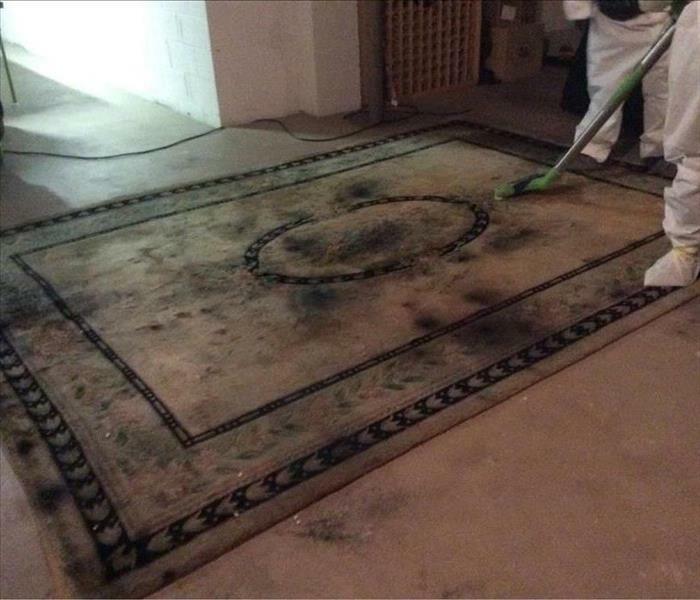 This rug unfortunately was never completely dried after being saturated, and mold quickly found a foothold. 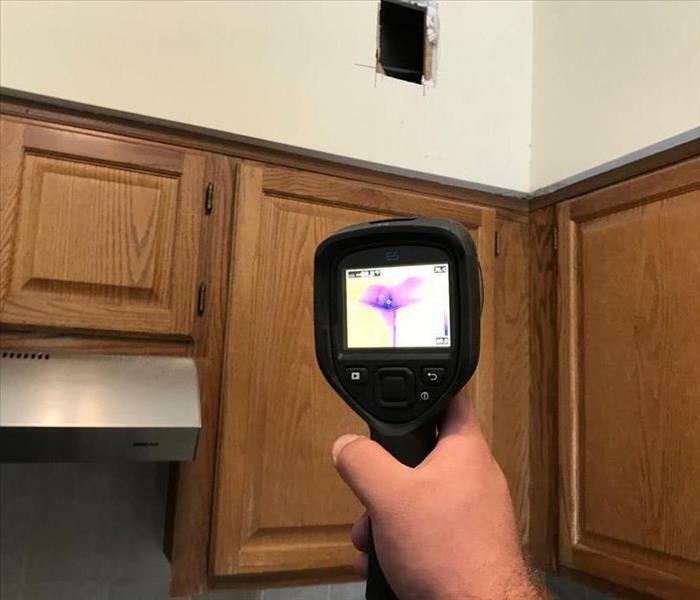 The professionals at SERVPRO of Eatontown/Long Branch were called in to use special equipment to remediate. 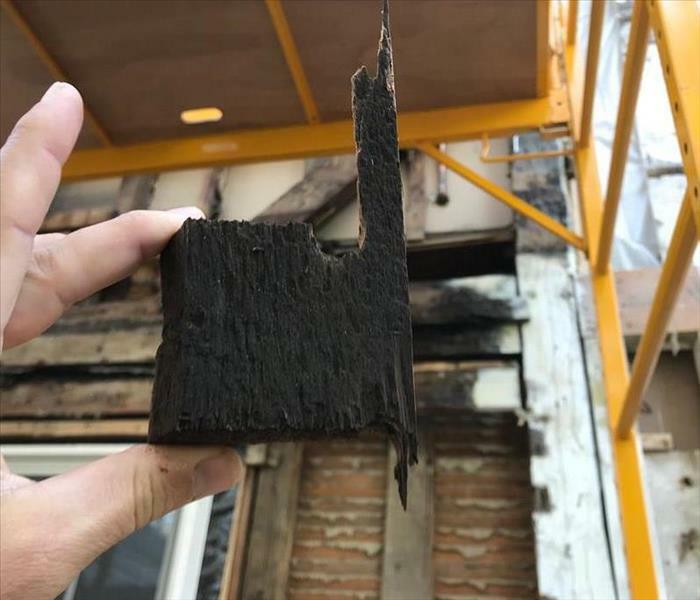 This fire in the kitchen of a Long Branch, NJ apartment looks like it may have been contained to the one room, but cleaning up after ANY fire needs to be professionally handled to make sure any soot and ash residue is thoroughly taken care of. Standing water anywhere in a house calls for professionals who have the proper tools and experience to take care of the issue properly. 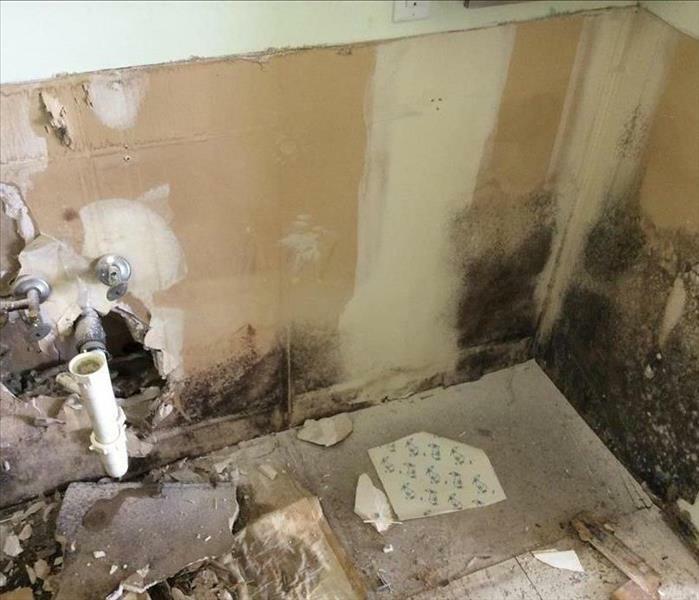 Leaving standing water can lead to a multitude of problems such as bacterial and mold growth. That's why calling SERVPRO of Eatontown/Long Branch will ensure your home will be taken care of quickly and properly. This structure in Neptune, NJ was badly damaged after a fire. 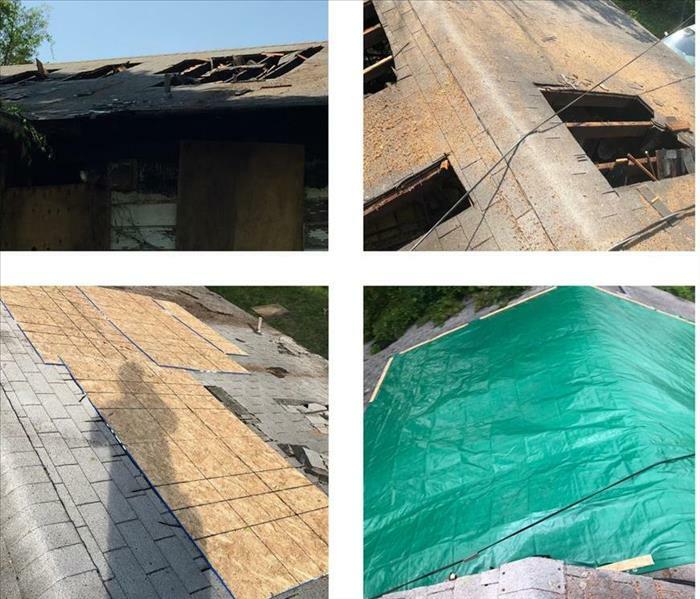 SERVPRO not only can clean and restore interior spaces from fire, water and mold, we can protect the exterior by boarding up windows and roofs until reconstruction. 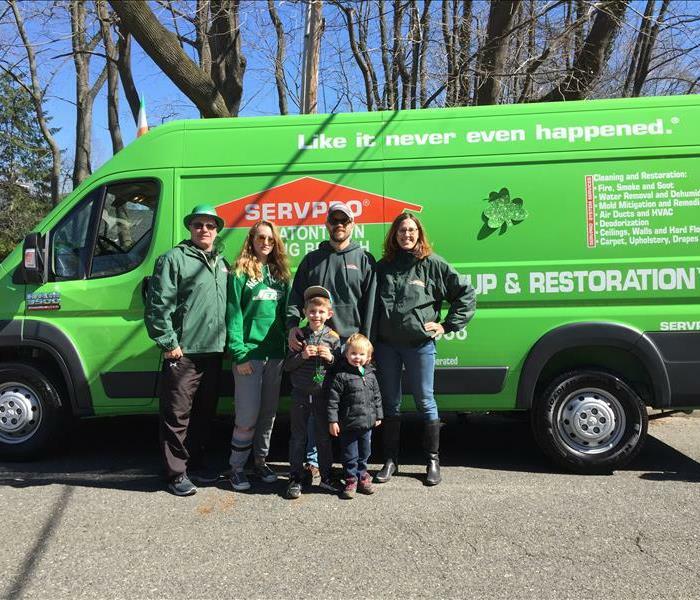 SERVPRO of Eatontown/Long Branch was on hand for the 2018 Rumson St. Patrick's Day Parade. It was a great turnout, and all the parade watchers loved the bubbles and frisbees that were handed out. All in all it was a great afternoon! SERVPRO of Eatontown/Long Branch donated 24 turkeys to help Langosta Lounge in Asbury Park, NJ feed those in need for the Thanksgiving holiday. Each year Langosta hosts this free meal event. 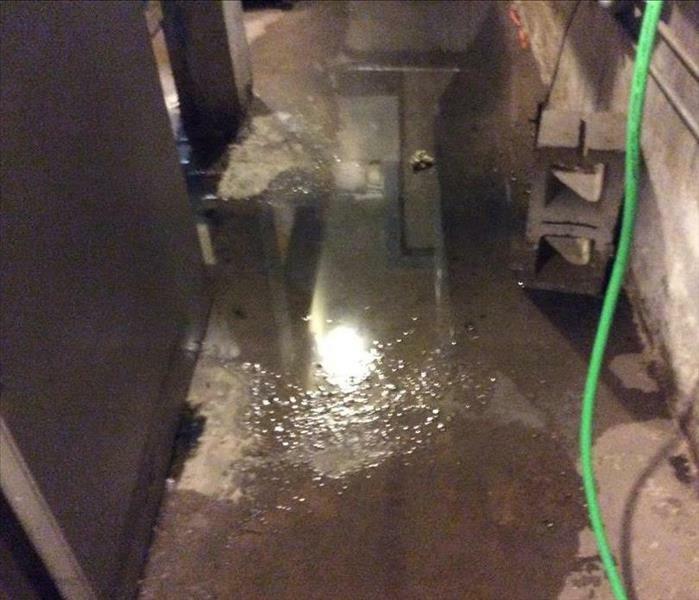 Sump Pump failure is a very common cause of basement flooding. Make sure your sump pump is operational before any expected storm to avoid problems. Periodic checks during the year will also help when ground flooding becomes an issue. Attics can be susceptible to mold, especially if there is a leak in the roof. Untreated, it can grow behind and in insulation, spreading through the house. Homeowners should not try to remediate by themselves. 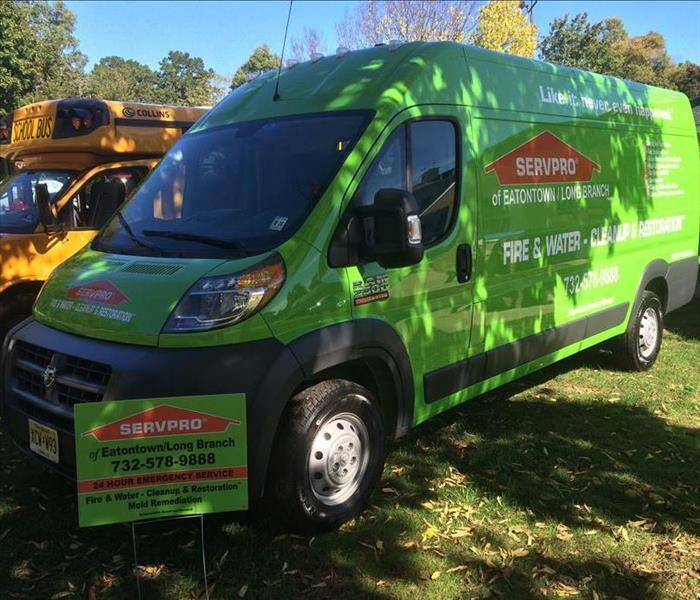 Call the professionals at SERVPRO of Eatontown/Long Branch. Fire extinguishers are a necessity in stopping a house fire, but may leave a big mess. 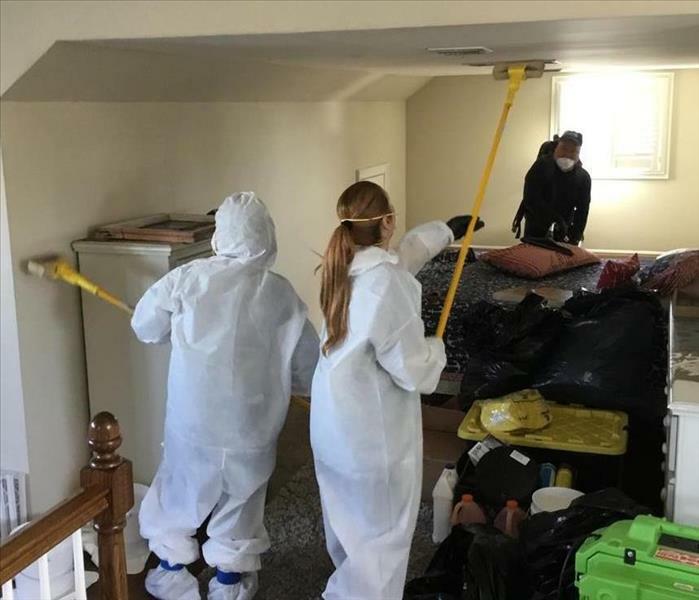 The professionals from SERVPRO of Eatontown/Long Branch know how to professionally and correctly clean dust and soot, leaving your home "Like it never even happened." This store in Red Bank had water leak through the ceiling. SERVPRO of Eatontown/Long Branch was called and began immediate work, helping the customer get back to business with minimal disruption. The Jersey Shore is particularly vulnerable to flooding due to ocean and river storm surges. 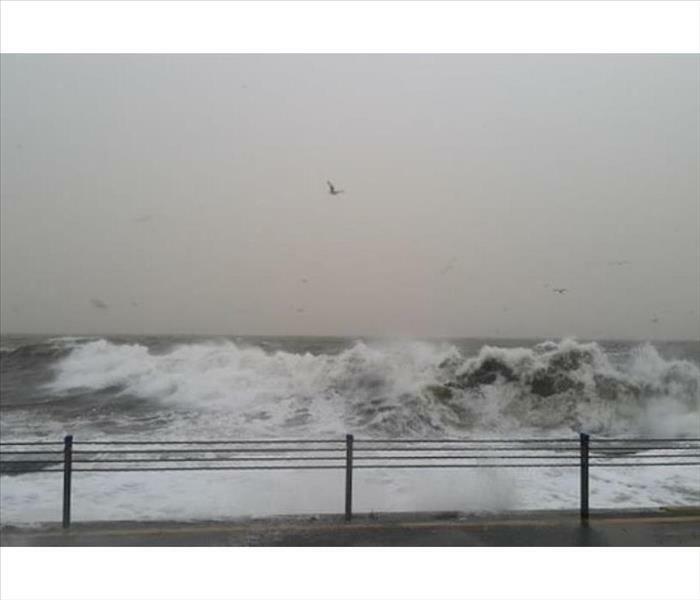 Towns like Sea Bright, Rumson, Little Silver and Fair Haven are all bordered by the Navesink and Shrewsbury Rivers, which during a major storm can see a surge over two to three feet which can affect your home. Mold can grow anywhere there is moisture, food source and poor ventilation. Once mold finds the perfect environment it will continue to grow and spread unless properly treated. Sometimes it can be hidden behind walls unseen by the homeowners. 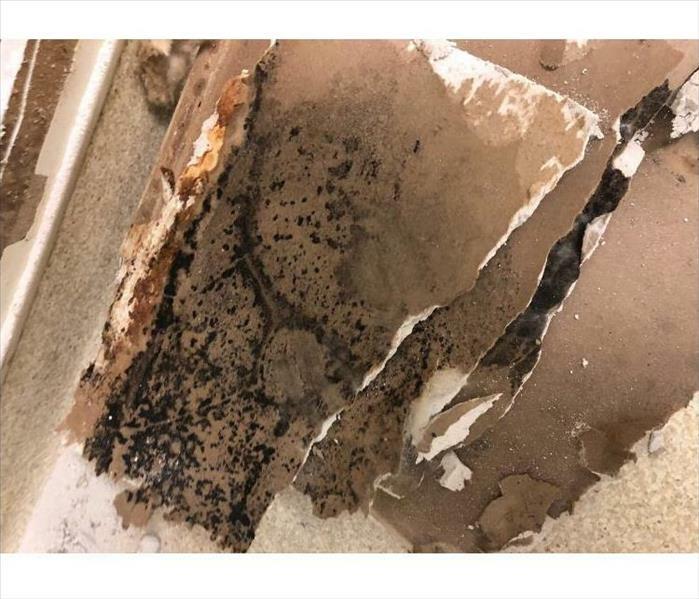 This commercial space in Eatontown was discovered to have mold growing behind sheet rock after water remediation was performed. Most likely it had been growing there for a while before the water leak occurred. 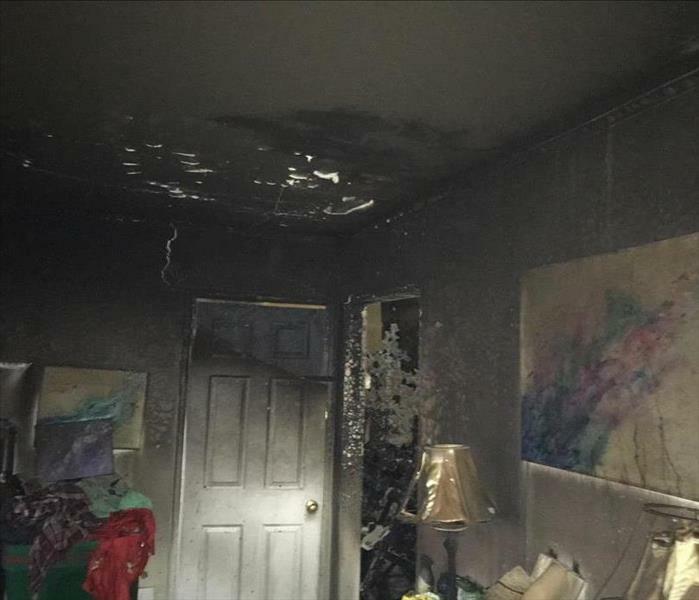 Fire in a home can be devastating, no matter how small. Damage can include smoke that lingers to soot and dust that can travel throughout the entire house. Hidden damage can lurk behind sheet rock or plaster walls. Water has a way of finding it's way into whatever crack or crevice is available. 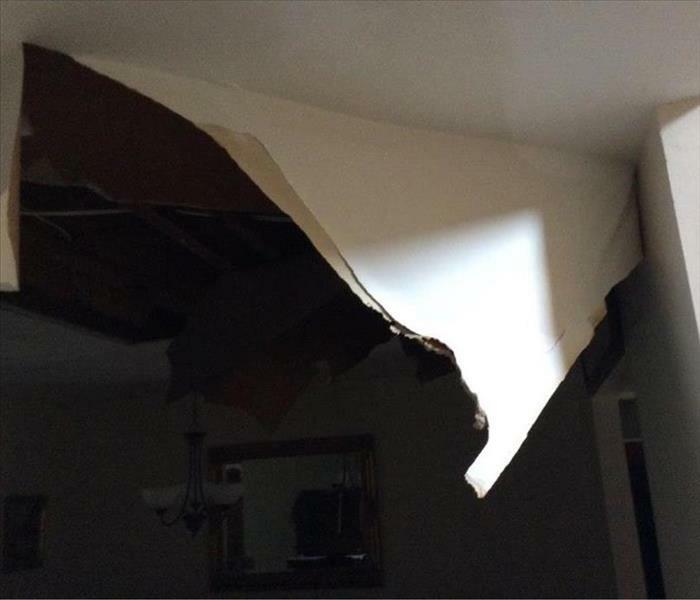 An overflowing toilet can cause severe damage, as seen by the ceiling collapse in this photo. If you have standing water anywhere, it is important to take care of it as soon as possible, if not immediately. Water, especially in spaces like basements can promote mold growth and other bacterial issues. 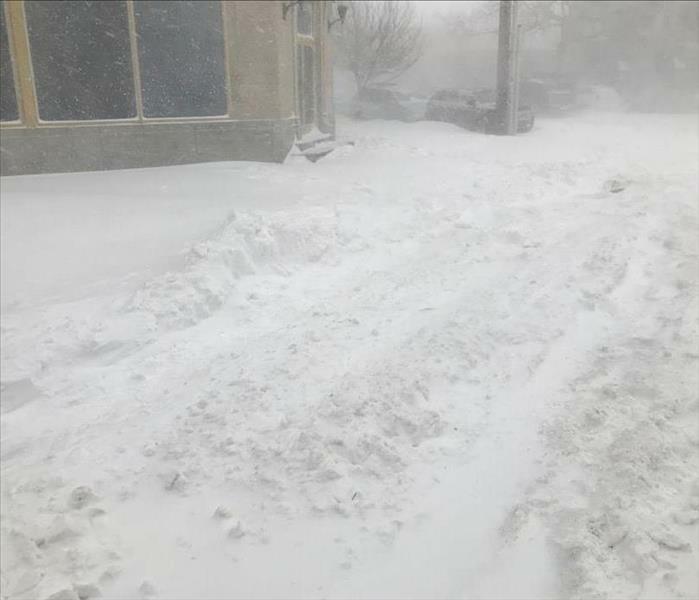 The Jersey Shore suffered frigid temperatures combined with a snow storm that dumped over a foot of snow in our area which resulted in frozen and broken pipes throughout Monmouth County. In many cases our kerosene heater was needed. The cold snap of January 2018 caused an overabundance of frozen and burst pipes. 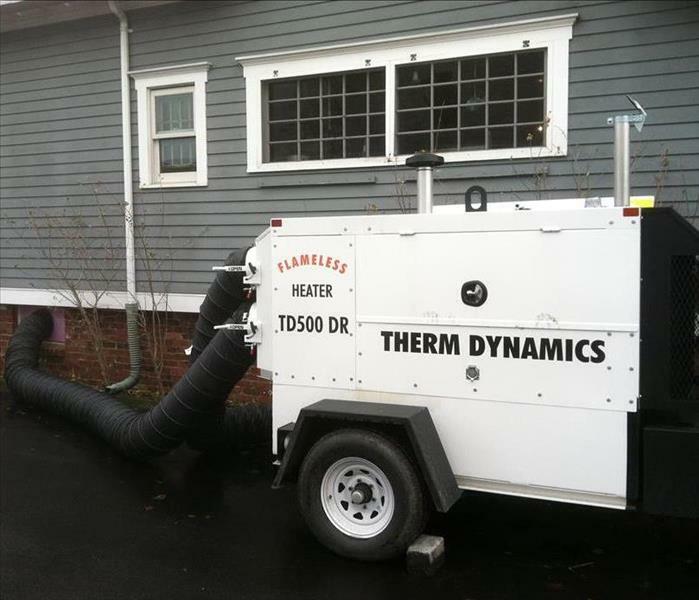 SERVPRO of Eatontown/Long Branch took to the road with all the extractors, air movers and dehumidifiers we had. 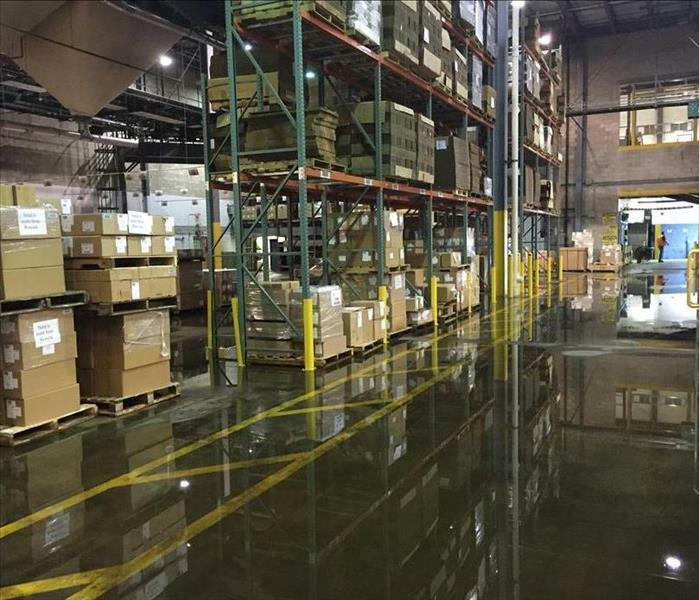 This warehouse in Monmouth County sustained quite a bit of water damage. SERVPRO of Eatontown/Long Branch was called in to extract the water and make sure there were no additional issues and all contents were safely dried. Water extraction had to happen quickly here, the space was needed for all the pediatric patients. SERVPRO of Eatontown/Long Branch was able to get the staff and patients back into the space quickly and with little disruption. Mold can grow anywhere and in any season if given the right conditions. Once mold finds the perfect environment it will continue to grow and spread unless properly treated. Remediation should be done by professionals. 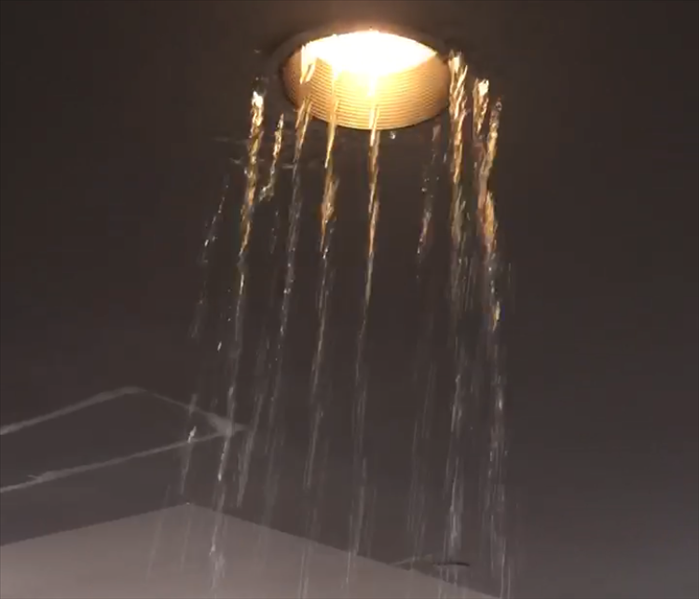 A fire sprinkler pipe that froze and burst in the condo unit in Asbury Park resulted in the entire space being inundated with water pouring out of the ceiling. 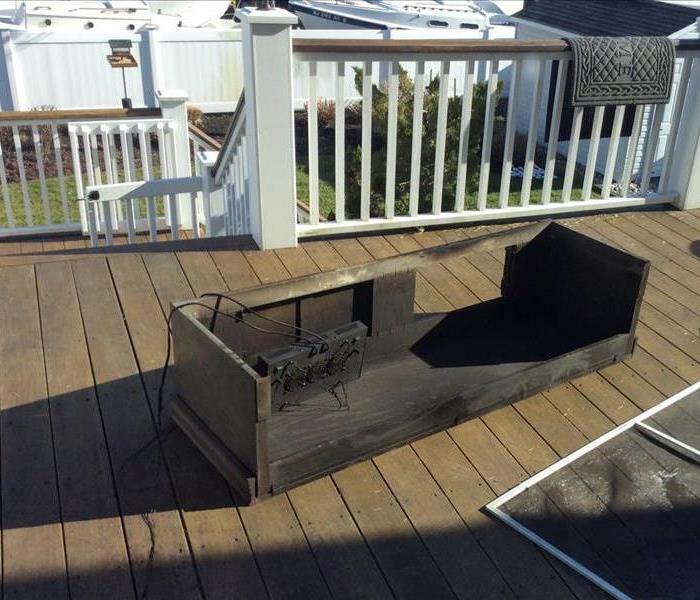 Luckily SERVPRO of Eatontown/Long Branch was there to take care of the damage. The Jersey Shore, along with the entire East Coast, was bombarded with frigid temperatures and a "bomb cyclone" that dumped over a foot of snow in our area. 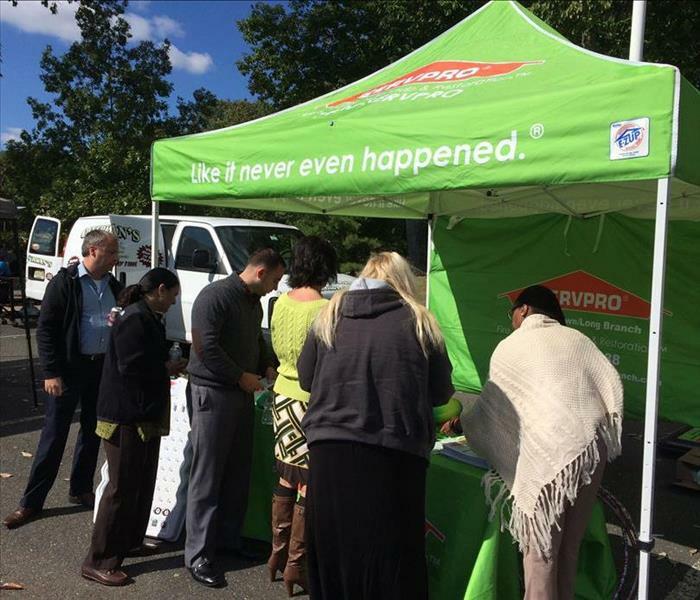 SERVPRO of Eatontown/Long Branch was out and about, helping our customers deal with resulting issues. 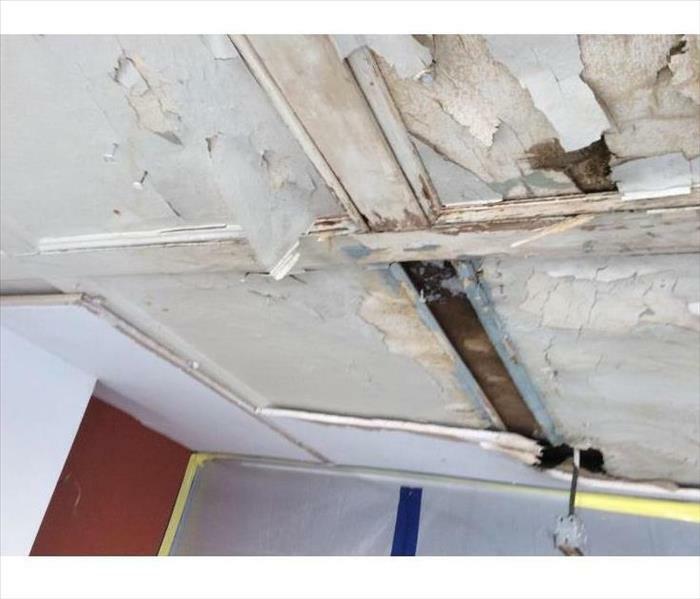 A frozen water pipe in a public bathroom in this office building in Eatontown resulted in water damage throughout. 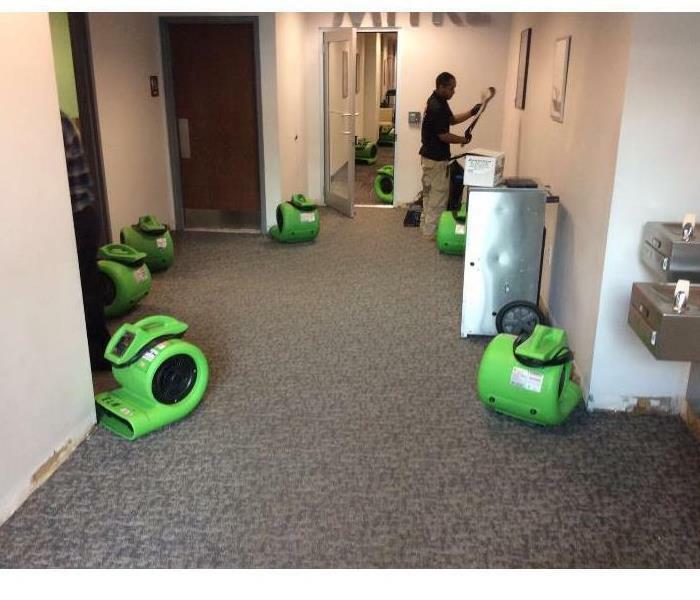 Pictured are air movers in the hallway after water was extracted. Water leaking from anything - broken hot water heater, pipe or bathroom - can affect just about whatever is below. 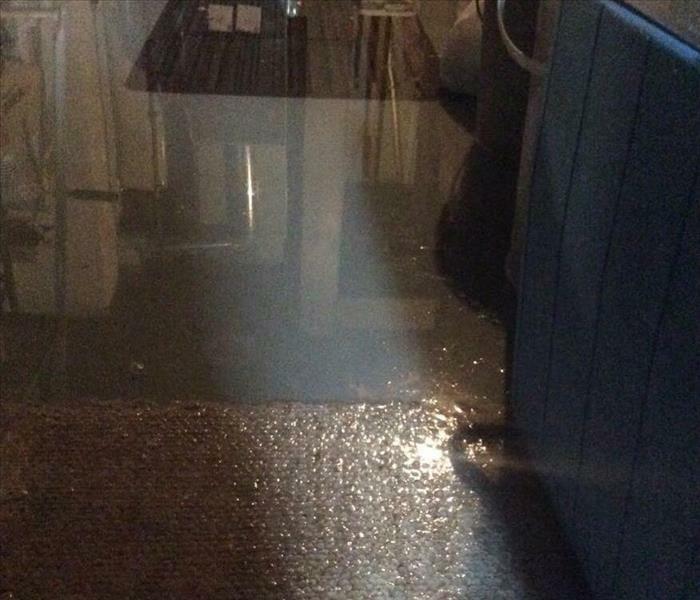 This apartment complex suffered water damage in the common area hallway. SERVPRO of Eatontown/Long Branch was able to extract the water and dry the area quickly, allowing quicker access for residents. Coastal towns are especially vulnerable during hurricanes, getting hit by wind, rain, and ocean flooding. This photo in Sea Bright, NJ, shows the devastation after Hurricane Sandy, which also dealt with tidal flooding of the Shrewsbury River as well. This bathroom had hidden mold behind the vanity, which was discovered during a renovation. It's easy for mold to grow in bathrooms due to the constant humidity. Add a potential water leak and it's a perfect environment for mold growth. 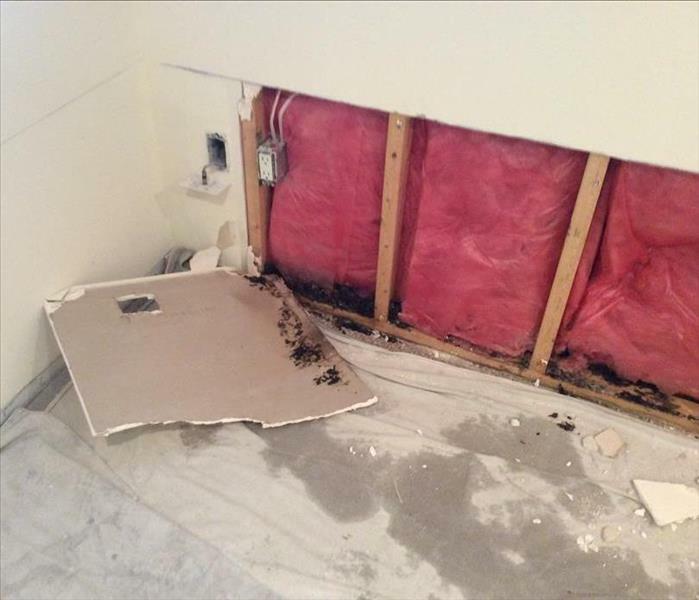 This office space in Rumson, NJ, was affected by a major water leak in a bathroom on the floor above it. Water destroyed the ceiling sheet rock and soaked the carpet and plywood flooring beneath. Because smoke can settle almost anywhere after a fire, lingering odor can last a long time. This house in Red Bank had lasting smoke odor months after the house was cleaned. The siding was removed to discover that there was charred wood. The smoke and soot damage in this apartment was caused by a fire in an adjoining unit. Smoke and soot are especially damaging, due to the small particles of soot that can get embedded in the smallest of crevices and cracks. 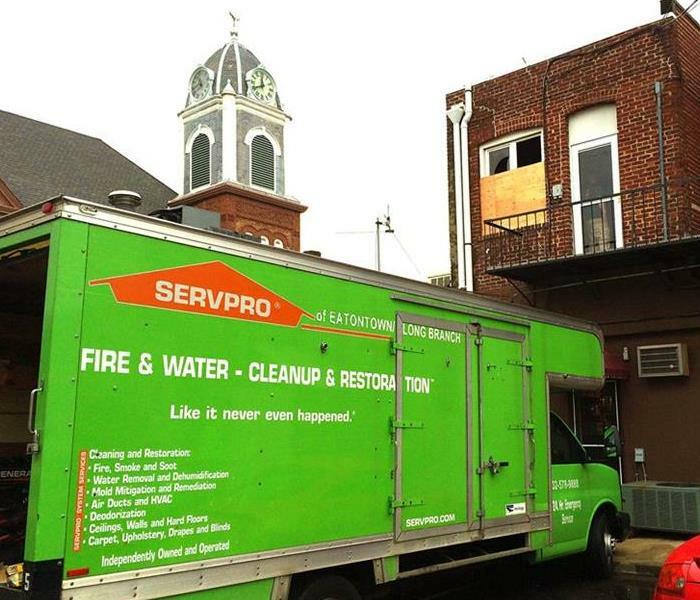 SERVPRO of Eatontown/Long Branch has special equipment to clean the air and household items after a fire. Taking care of mold is serious business. 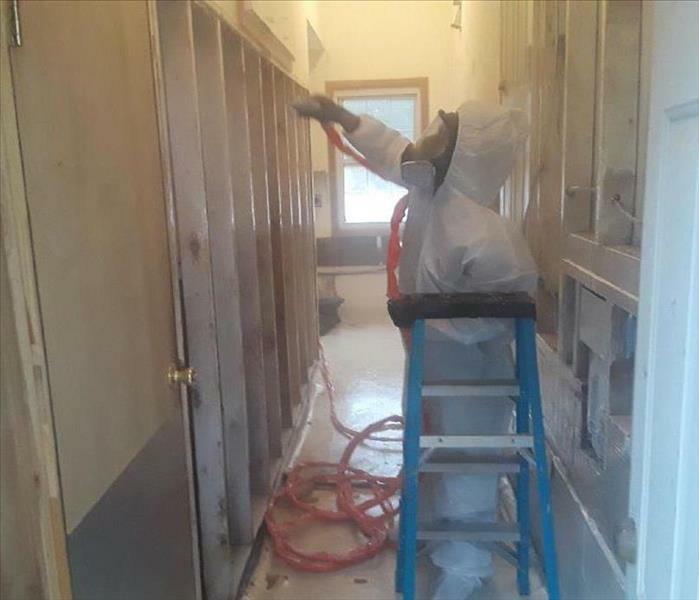 Pictured is one of our technicians wearing protective gear as he works on mold remediation. 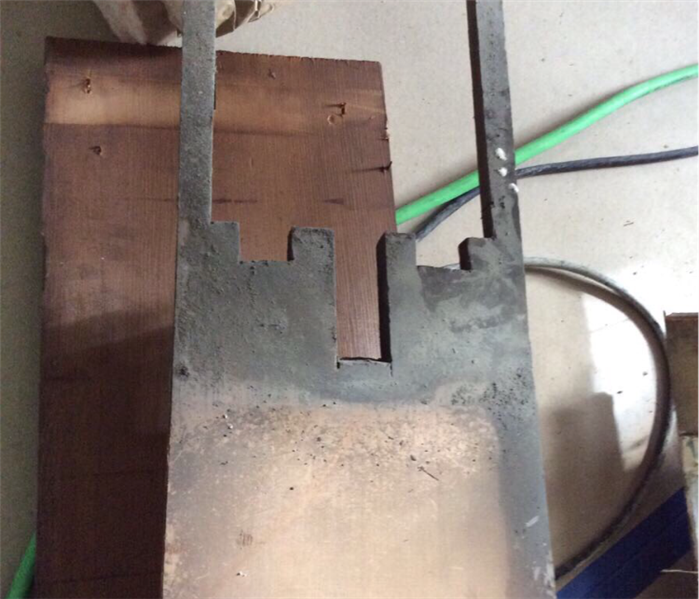 If left untreated, several health issues could have been a major problem for the homeowners. Just because something looks dry, doesn't always mean it IS dry. This infrared image show that there is still moisture behind the wall in the water damaged kitchen. You need to call us and make sure that your home is properly taken care of! SERVPRO of Eatontown/Long Branch at the scene of an apartment fire in Red Bank. We were able to get in and remediate the damage cause by smoke and flames. Marketing Reps Laura and Dan at the boardwalk in Long Branch for Oceanfest 2014. We enjoyed another beautiful night at First Energy Park July 2014. Another local tradition: The Monmouth Beach Fair. 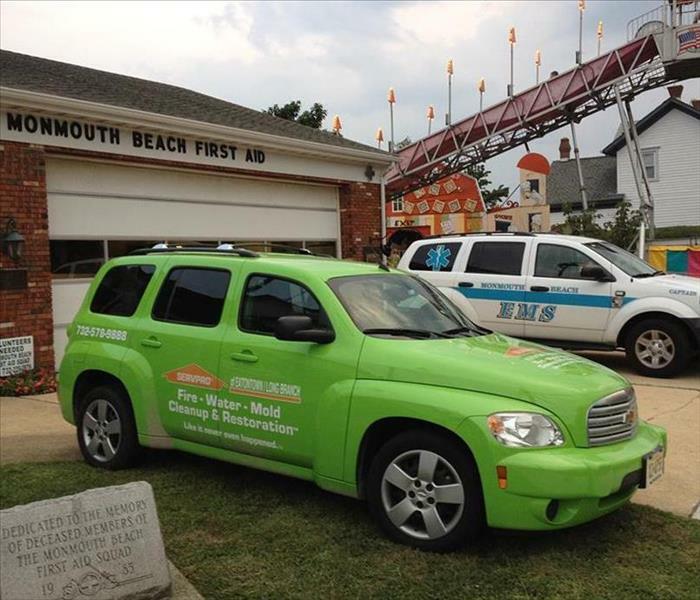 At SERVPRO of Eatontown/Long Branch, we are on call 24/7/365 to clean and restore your home or business in an emergency. 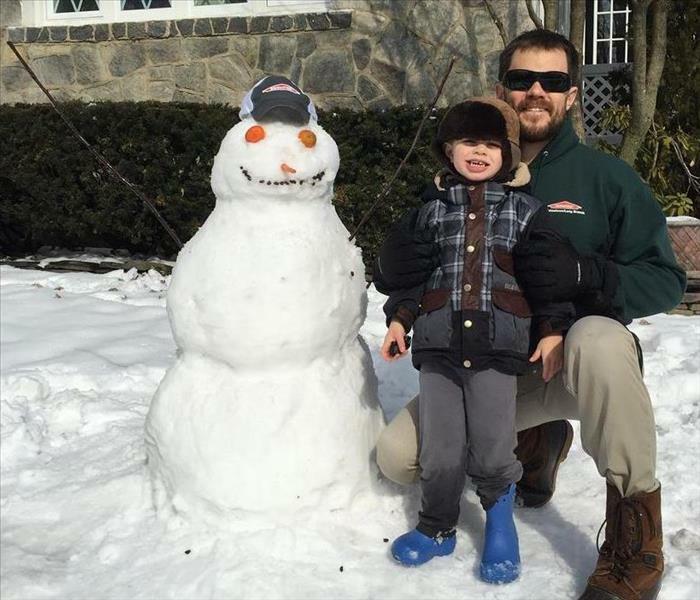 SERVPRO of Eatontown/Long Branch owner, John Majeski, and his son Johnny, posing with their new creation, the SERVPRO Snowman. Marron Wellness Center stopped by this morning to give the SERVPRO of Eatontown/Long Branch staff a much needed break from our busy Winter work schedule. SERVPRO of Eatontown/Long Branch owner John Majeski and his son Johnny getting the vehicles ready for the parade. 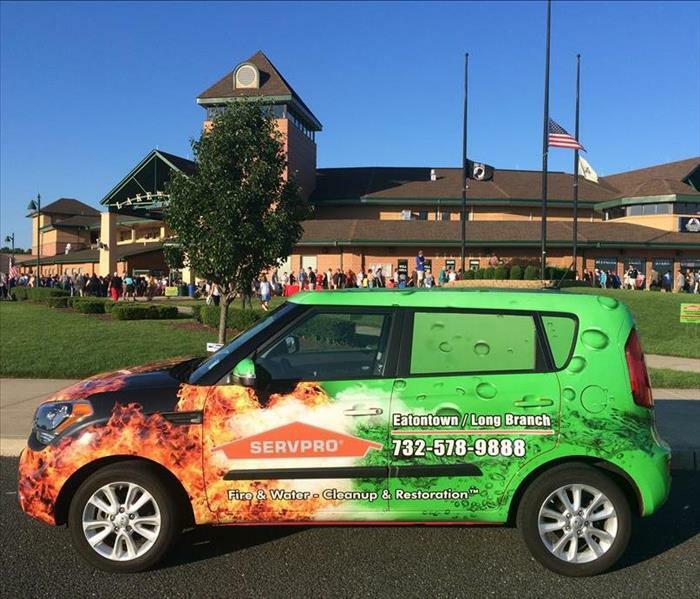 SERVPRO of Eatontown/Long Branch is a proud sponsor of both the Shore Regional Little League and Fair Haven Little League. A great way to spend a Summer evening at the Jersey Shore. 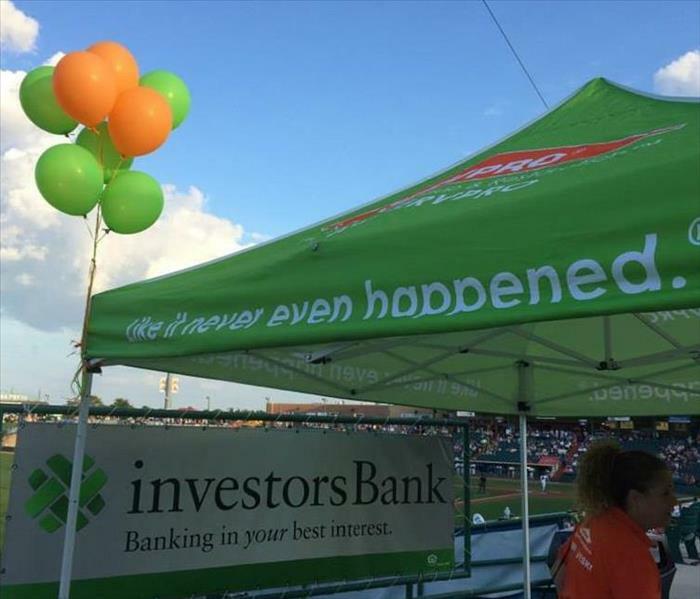 Our annual SERVPRO Night At The Blueclaws. We were back at First Energy Park in Lakewood with clients and friends for a VIP BBQ and baseball game. SERVPRO Of Eatontown/Long Branch is proud to be a sponsor of the annual fundraising event for the Newcomers Club in Fair Haven. It was a beautiful Fall day to showcase the Promaster. SERVPRO of Eatontown/Long Branch at John's Auto And Truck Repair. The shop suffered a large fire while changing out a gas tank on a customer's vehicle. No one was hurt and we were on the scene quickly to get the shop up and running again. The weather was perfect once again in Eatontown as we celebrated the start of the season with our clients in Eatontown. 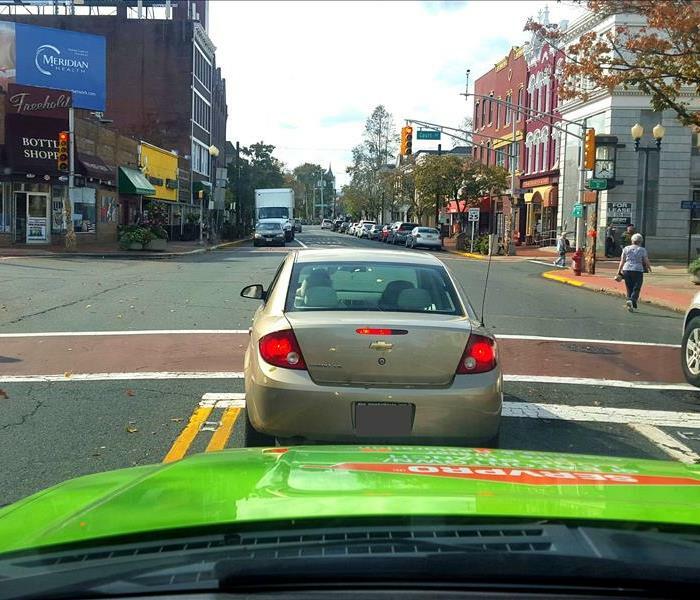 SERVPRO of Eatontown/Long Branch on the historic streets of downtown Freehold NJ. Cleaning up fire, water and mold damage in the Boss's hometown. 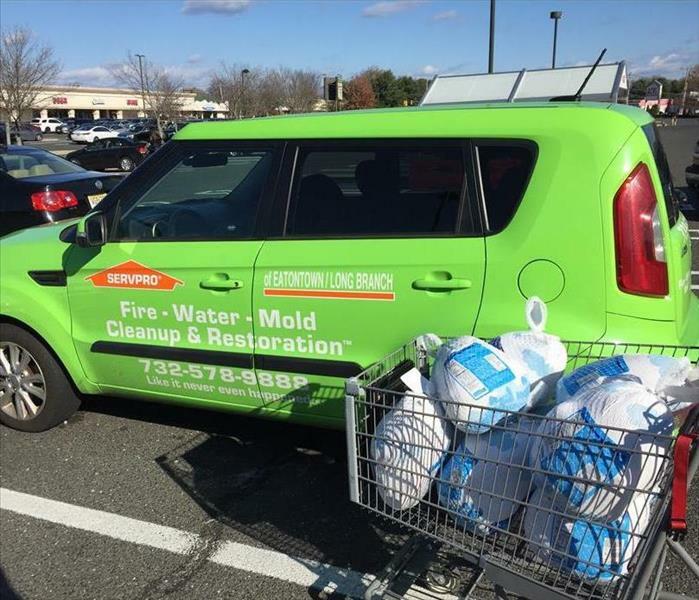 SERVPRO of Eatontown/Long Branch is ready year round, in any type of weather to help you in an emergency. Call us 24/7/365. SERVPRO of Eatontown/Long Branch owner, John Majeski, surveys the donations during our Superbowl weekend food drive at Acme in Little Silver, NJ. All donations went to help the Foodbank of Monmouth and Ocean Counties.